First-year medical students Brittany Demmings and Tia'Asia James meet Edith Irby Jones, M.D. (at right) after receiving scholarships created in her name. 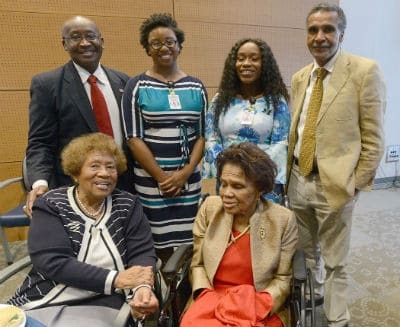 A month-long celebration of the life and career of Edith Irby Jones, M.D., who enrolled 70 years ago at UAMS as the first African-American student in the South to attend a previously all-white medical college, brought thanks and appreciation from those she inspired and served. A pioneer in the desegregation of higher education in Arkansas and the South, Jones has a distinguished career as a doctor, educator and philanthropist. She graduated from UAMS in 1952. Three events, sponsored by the UAMS Center for Diversity Affairs, were set to honor Jones’ legacy: a Sept. 5 historical presentation and exhibit; a Sept. 12 four-woman discussion panel; and a Sept. 19 luncheon with Jones herself in attendance and featuring M. Joycelyn Elders, M.D., former U.S. surgeon general, as keynote speaker. Co-sponsors were the UAMS Library and Historical Research Center, the UAMS College of Medicine and the college’s Office of Faculty Affairs. Erick Messias, M.D., speaks on Jones’ legacy. Erick Messias, M.D., associate dean for faculty affairs, hosted a presentation Sept. 5 in the Active Learning Center of the UAMS Library. A capacity crowd listened intently as Messias went over the struggles that Jones endured throughout her life and career. (Read Dr. Messias’ full essay). “This African-American woman, five feet tall, was a giant,” Messias said. Jones was born near Conway in 1927. Her father, a sharecropper, died when she was eight, and her older sister died of typhoid fever at the age of 12, largely due to her impoverished family’s lack of access to medical attention. Jones herself suffered from rheumatic fever as a child and was unable to walk or attend school for a year. These experiences prompted her to seek a career in medicine, with the goal of helping those who could not afford standard medical care. In 1948, Messias said, there were approximately 6,500 medical students in the country, but only 185 were African-American – and nearly all of them attended historically black colleges. 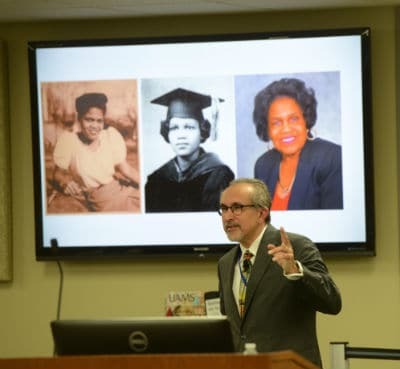 Jones ranked 28th out of 230 applicants to UAMS that year, and H. Clay Chenault, M.D., then dean of the College of Medicine, made the decision to desegregate medical education and accept her. That year, Messias said, the University of Arkansas Board of Trustees voted to increase the class size by one, so that it could not be said by those in the public who opposed the decision that Jones was somehow “taking a spot” from a white person. Although she had been accepted to attend classes, Jones faced death threats and intimidation, and was not allowed to use the same dining, lodging or bathroom facilities as other UAMS students. Resisting the segregationist rules, many of her classmates chose to eat with her and study with her at her apartment. After graduation, Jones opened a general practice in Hot Springs before moving to Houston, Texas, and becoming the first African-American woman intern at a Baylor College of Medicine Affiliated Hospital. 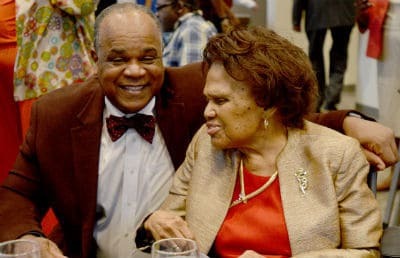 She maintained her practice in Houston’s “third ward” for several decades, serving those who could not afford to go anywhere else for medical care. In 1985, Jones was elected the first female president of the National Medical Association, and is the only female founding member of the Association of Black Cardiologists. She has taught, consulted, or provided health care in not only the United States but in Haiti, Mexico, Cuba, China, Russia and throughout Africa. Jones continued teaching and practicing medicine at the University of Texas Medical School and the Baylor College of Medicine until 2014. Messias emphasized that medical education still has a ways to go to build on Jones’ legacy. Rodney Davis, M.D., credits Jones with helping him pursue a career in medicine. Messias pointed out that only 7.2 percent of the UAMS College of Medicine students are African-American – less than half the proportional representation of African-Americans in Arkansas. The number of African-American residents and faculty at UAMS have improved, he said, but are low. Still, Messias believes that things are looking up. 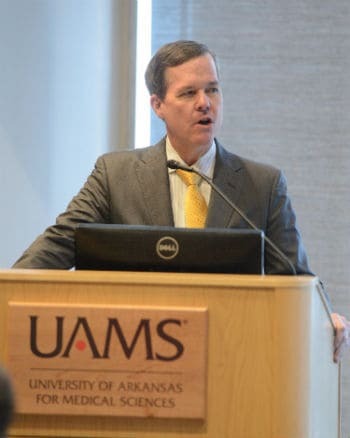 Rodney Davis, M.D., professor and chair of the Department of Urology in the UAMS College of Medicine counts himself among those mentored by Jones. An internationally recognized urology expert, Davis was the first African-American to lead a urology department in the United States. He opted for a career in medicine over missionary work, and met Jones at Baylor University. 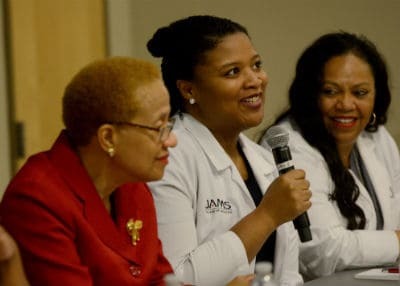 At the second event honoring Jones on Sept. 12, a four-woman panel, moderated by Lanita White, Pharm.D., director of the UAMS 12th Street Health & Wellness Center, discussed the struggles of making it in the medical field, both as women and as African-Americans. Sasha Ray (center) responds to a question as part of a four-woman panel discussing struggles in the medical field. The panel consisted of Linda Haynie-Green, M.D., who established the first Arkansas chapter of the Student National Medical Association (SNMA), a student-run organization focused on the needs of medical students of color; Ronda Henry-Tillman, M.D., chief of breast oncology in the UAMS College of Medicine Department of Surgery; Nichole Bauknight-Boles, M.D., a child and adolescent psychiatrist; and Sasha Ray, an SNMA regional director and third-year student. They shared stories in turn of establishing their medical careers, with similar themes about being overlooked and underpaid that had many of the women in the audience nodding along. Bauknight-Boles, a 1995 graduate of the College of Medicine, remembered profiling and speaking to Jones when she served as a keynote speaker at graduation. She received emotional support from custodial staff while going through medical school, like Jones had. “I had to wonder how in the world [Jones] got through [medical school],” she said. “It was amazing to know that those same people were looking up to us in 1995, and were praying for us,” she said. The panel took questions from the audience and discussed various strategies to combat stereotypes and being stigmatized. An invitation-only luncheon on Sept. 19 in the Hospital Lobby Gallery capped off the month-long celebration, with nearly 100 admirers present to welcome Jones back to UAMS. Chancellor Patterson credited Jones as an inspiration to countless others in the medical field. “Your footprints are all over this institution,” Patterson said. He presented Jones with a commemorative glass sculpture in honor of her contributions to medicine. Christopher T. Westfall, M.D., dean of the College of Medicine, announced an endowed scholarship created in Jones’ honor by retired Maj. Gen. Elder Granger, M.D., a distinguished alumni in the College of Medicine. Westfall and Elders awarded two scholarships to first-year medical students Brittany Demmings and Tia’Asia James. Elders, an emeritus professor of pediatrics and distinguished professor of public health, was the first African-American, second woman and first Arkansan appointed as U.S. surgeon general. She was inspired to become a doctor in 1950 after hearing Jones give a lecture at Philander Smith College. “It was because of that talk that I’m here today,” Elders said. M. Joycelyn Elders, M.D. (seated, at left) credits Jones as her inspiration. Behind them are (from left) Elder Granger, M.D., Brittany Demmings, Tia’Asia James, and Billy Thomas, M.D., M.P.H. Myra Jones Romain, Jones’ daughter, spoke on her mother’s behalf of her love of UAMS. She would receive financial help from the community as a show of support, Romain said, such as a quarter taped to a piece of cardboard from members of her church. Once, when she was missing $50 for tuition, Daisy Bates collected the amount for her in a coffee can.